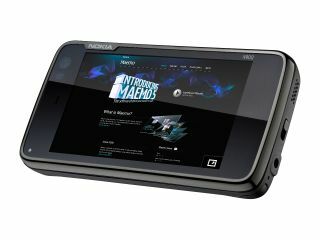 Vodafone are official carriers of the Nokia N900 handset in the UK, with the telco unveiling the device on its website. TechRadar hinted last month that the phone would come to Vodafone, after the carrier announced it was to stock the phone in Ireland. Although no confirmation was forthcoming, a month later Voda is now official stockists, with the phone due to hit stores in January. For those who have been under an iPhone-shaped rock for the past few months, the Nokia N900 is an uber-powerful handset which uses the Maemo 5 operating system, based on Linux. This means it won't melt when you want to do multi-tasking. Also on board is a high-res screen, 3.5-inch screen and although it's resistive we have tried it and it works like a dream. Couple this with the fact that it will be among the first devices to have Firefox mobile and what you have is a device that looks ready to take on the Google and Apple's of this world. The Nokia N900 is officially coming soon on the Vodafone website, with a release date of January. If you want to register your interest in the device, then click here.